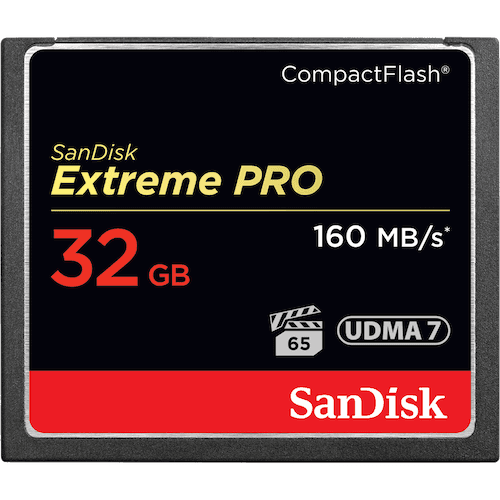 Get high-capacity storage, faster shot-to-shot performance, and cinema-quality video with the SanDisk Extreme PRO CompactFlash Memory Card. With transfer speeds of up to 160MB/s1, this card offers the fast, efficient performance you expect from the global leader in flash memory cards2. This industry-leading memory card is optimized for professional-grade video capture, with a minimum sustained write speed of 65MB/s1 for rich 4K and Full HD video. Capacities up to 256GB accommodate hours of video and thousands of high-resolution images. So you never miss a scene or shot, this memory card resists extreme temperatures, shock, and other conditions.